Cittàgazze was in Oxford lately. We were lucky to meet Philip Pullman outside the Ashmolean Museum during a warm and sunny afternoon. 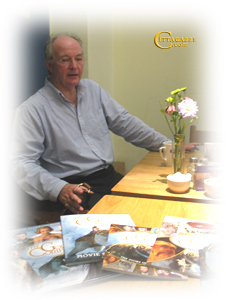 We settled in a coffee to discuss and interview the writer. He immediately showed us the books he has received the morning : the tie-in books. While we look these books, he gave us more informations and his opinion about the movie, currently in cutting. On the site, we spoke about the sequels, but he told us it's not sure to make the two other movies. The end of the first movie is very important because it must end the story without close the way to sequels. But the aim is always to make a good movie for audience. About the movie, was Philip Pullman involved in it ? Philip Pullman : I&apos;ve been involved with the film, not officially, I&apos;m not a producer, but they consulted me all the way through, ask my opinions, ask my advice. I&apos;ve been written some of the scenes, so I had quite a lot to do with it. And my impressions are that the costumes, the sets and all the designs stuffs work very well, look very well. The acting is brilliant and as for the story, it up to the editor to get it right. But never know [laugh]. Cittàgazze : Were you involved with the choice of Nicole Kidman? PP : Oh yes. When I first sold the films rights 10 years ago, the one just I wanted from the beginning was Nicole Kidman to play Mrs. Coulter. She&apos;s perfect, she&apos;s magnificent. I can&apos;t tell you how good she is. She&apos;s beautiful of course, but she&apos;s also a wonderful actor, she can just raise an eyebrow, a little like that [movement of Philip Pullman&apos;s eyebrow] and the whole thing get cold. She&apos;s fantastic, wonderful. She was a very important actor to get for the film and it took a long time but eventually she agreed. Daniel Craig is Superb! I&apos;ve seen him in a number of different films a long time ago. I&apos;ve seen him and I knew he was a good actor. When he started doing this film, he was not a big star, but in November last year, Casino Royale and suddenly all over the world Daniel Craig: big star. And it made a difference for the interest in the film. Suddenly, there wasn&apos;t only Nicole Kidman, but James Bond! So, that made a big difference. Dakota, well, she was of course unknown. It was important to us to get a child never acted before because the things we&apos;ve experienced with child actor is there are too good, too thoughtful, they too practice and we wanted someone who looked a bit more shy, wild, sauvage. She is perfect, she is extraordinary. And they had auditions, join of them,and they were ten thousand little girls and they film on DVD about fifty/sixty out of the best. And I looked at the DVD of the last fifty or sixty. And they were all good. But this one was perfect but too young, that one was good but too old, and this one one was wonderful but had a screechy voice, this one voice was perfect but she had crossed eyes. They were very good, but the best without any question was Dakota. So everybody agreed at once. She got the job, we were very lucky. Citt : When I met her in Shepperton studio, I thought "this is Lyra." PP :	Yeah, no doubt about it. And she was across the first week of filming and she was doing the scene with Nicole Kidman, and Nicole is terrifying, she's very cold, very strong, very like Mrs Coulter. And poor little Dakota was terrified, as she should be. But it was interesting to watch as the film was going on she gained a little bit experience, she developed as an actress. Daniel Craig was very helpful to her because he could see she was nervous and before they did a scene together for the first time, he said : " Come on, let's jump ! " [Pullman jumps on his seat] So she did and stop to be nervous. He's a very vigorous, very physical, very athletic actor, very generous emotionally, and she pick that up, she's very good in the scene with him because he gave her a laugh. In fact, every actor helped her because they saw how she had a very hard role. That's all about her. PP : Well, Sam Elliott is magnificent. I didn't know his work before, I didn't see him. But actually the part of Lee Scoresby was the easiest to cast, and there is a lot of actors who could have played Lee. Kevin Bacon ! Samuel L. Jackson, why not a Black actor ? He could be very good. I had suggested him. But Chris Weitz came up with Lee, and he's just marvellous, brilliant, the whole cast is brilliant. And the special effects, the computer generated effects. I always knew the danger with that. It could be too much. Too much imagery, too much computer... And when they came they had a scene with a lot of people in it and the question was what to do with the people's daemon. If they had a daemon all the time, it they see them all the time it was getting ridiculous, it was like a zoo, so many animals. So I said to them you don't have to show the daemons all the time. Sometimes they might hide in a pocket, be on the floor or just asleep. We just don't see them all the time. So they discovered that and they went through. The best way to make a good work is a visual story. Citt : As you're often as a children author or fantasy author, do you often read books of this kind ? PP : The first thing to say is that I haven't read Harry Potter. I met JK Rowling, I like her, I got very respectful with what she has done. I actually have read one Harry Potter, the second one, but I haven't read any other. Perhaps I shall but I don't know very much about Harry Potter. I'm reading now a book which I think is really good. I think it is a Canadian author, Kenneth Oppel, and it's called Air Born. It is a novel which is set in a world which is like our world, but with bog balloons, and zeppelins. It's a good exciting story. I enjoy it. Other fantasy books... I like two english writers. The first one is Diane Wynne Jones, she's very good, and another author I like very much is Eva Ibbotson. She's e very skillful, very intersting, very succle author. I like her a great deal. There is such a lot of great authors, I haven't time to read all of them. Citt : When you was a child, had you any favourite book or author ? Citt : We often see in your books children who kill someone: Sally Lockhart, Will, etc. Is there any reason to that ? PP : Well that's a story of adventures. That's a story of life and death, it's a story in which big dangerous things happen. Tragically, sometimes. It's very hard, impossible, to write a story in which everybody is nice, is happy, and nothing goes wrong. You can't do it. Will is the hero of the story but he only kills when he has to. He's a very reluctant fighter. He hates doing it. But he does fight when he has to. Citt : In Darkness Visible, it is said you used to create stories as a kid. Did you use some of them in your books ? PP : No, it is simply the experience of storytelling, not any particular story. What I liked to do was to begin a story with any idea and see where it could go. I liked it, experiences were so exciting, I was happy, I tried to retain that feeling. But what the stories were, I don't know, I forgot most. Citt : Is John Parry's name a reference to the conqueror of the Pole, or to John Milton's and Idris Parry's name ? Citt : Speaking about the French version, did you read it ? PP : A little, yes. I haven't read whole of it, but I read enough to be happy with it. It's well done. Unfortunately, it is the only language except English I can read. The other thirty-eight translations, I've no idea how they look. I just sold the rights for the Hindi and Malayala. It is one of the languages in Central India. It must be the fortieth I think. And I can't read it. Citt : About the Book of Dust, it is a true sequel to His Dark Materials ? A novel or short stories ? Citt : We'd like to speak about the adaptations. Your books have been adapted for TV (Sally Lockhart) but also for theatre, radio, cinema... Did those adaptations interfered with the vision of your own work ? PP : That's an interesting question. If there had been one adaptation, perhaps it would have been, but because there have been so many Lyra ... I don't know how many : the radio one, the audio-book, the first actress to play her on the stage adaptation - Anna Maxwell Martin, there was the second one, Dakota... which give us five already. And so, each one give a particular quelque chose ["something" in French] to my idea of Lyra. I've said Dakota was the closest, Dakota is almost perfect, nut all of the others brought something special as well. The actress who played her on the stage, with the National theatre in the first production, Anna Maxwell Martin, was simply wonderful. She was grown-up, she was 24-25, but because it was well written and because of the way of the stage, it was completely convincing. She was a wonderful actress. So I felt very lucky as well as so many different Lyra. I've been very lucky, they've been very good. They've all been very gifted actresses. It could have been not good at all, so that's help as well. Citt : Would you like to appear in a movie adapted from your books ? PP : Oh, like Hitchcock ? No, I don't want to. I enjoyed reading the full unabridged audio-books, that was something I enjoyed very much. I read the narration and I had actor to play the different parts, and that worked very well, and again, they were very good. But I'm not an actor. Citt : Now, some more specific questions. What story could you tell to Gracious Wings ? PP : [laugh, and silence] Falling in love. When I first fall in love, when I was young. [silence] I remember it very well, I was at school, I was twelve year-old. Our teacher was away for some reason so we had to have my class, boys and girls, to go and seat with another class in the big hall of the school where the music teacher rehearsed some song. So we were two mixed-up classes. And it was an autumn afternoon, and the sun was shining through the big windows and we were just supposed to be there and be quiet. And then we started singing the carol or whatever it was. It was the first beautiful tune I'd ever heard before and I didn't know what it was, until many years later when I listened to the opera The Marriage of Figaro, by Mozart, and it is the aria called Voi Che Sapete. I don't know if you know this, Voi Che Sapete, it is sung by Cherubino, a young page-boy who's asking the older ones what is it like to fall in love. He's singing a song about what is like to fall in love. "What does it look like? Come, I don't know, I want to know". Now, I didn't recognized Mozart because he was not singing in Italian, not in English, but in Welsh, because he was in North Wales. Citt : Do you often go on websites about your books ? PP : Not very much because it takes so much times. I use the Internet only for e-mails. Almost nothing else. A have this website somebody else does for me. I don't write... I should. Apart from cittagazze.com, bridgetothestars.net, hisdarkmaterials.org, there is one in Israel maybe others, I don't know. Maybe there's one in Lyra's world, but I don't know ! PP : Oh, yes. 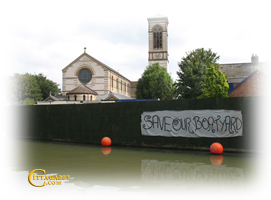 There was a boatyard, it used to be where they repaired their boats, pit and rope them. The latest situation is the company that has bought the land to build houses and flats, they have to ask the local council for permission first, they haven't got yet and they've been waiting for here. The boat-owners came to me and asked if I can helped. I was glad to but I don't live near the canal, I live somewhere else; it isn't something I can see everyday. Have you been along the canal, yes ? Well, you've seen the fence ? It used to be covered with razor wire, with lights. It was terrible it was like a fascist concentration camp. It's disgraceful. But I don't know what will happen. I do hope the boat-owners will get something, they might get whatever they want. They do need some water to repair their boat. It's common sense. Citt : Is there any question you've never been asked and you would like to be ? PP : [laugh]No, I don't think there is any question I've never been asked. I've been asked every question there is, apart the one about Gracious Wings, that was good. Citt : We'd like to ask you a little quiz : ten questions with short answers. They used to be asked by Bernard Pivot in a French literary broadcast. What is your favourite word ? Citt : What is your least favourite word ? Citt : Which profession other than yours would you like to do ? PP : Illustrator. I would like to draw. I already do a little bit of that, but I'd like to do it all the time, because when I draw, I can listen to music. When I write, I can't. Citt : Which profession would you like not to do ? PP : Teaching ! I used to be a teacher. Never again ! Citt : What turns you on ? PP : Rhythms. In near street just now, there are African drummers. They're very good. I stopped to hear them. But rhythms of all kind. 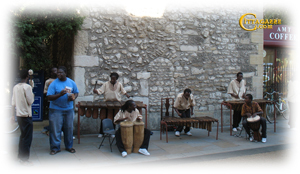 African drums, jazz, classic music, too. Citt : What turns you off ? PP : Rhythms. Rhythms in the wrong place. Rhythms when I want to write. My older son is thirty-five years-old. He's a professional musician. He plays the violin. When he was young he was practising. I couldn't write because of the sound. I could just listen to music. I couldn't possibly write a line because of the rhythms. So rhythms turn me on, but also rhythms turn me off. It's when I want to write. Citt : What is your favourite sound? PP : Wind in the trees. Citt : What is your least favourite sound ? Citt : What is your favourite curse word ? Citt : If Heaven exists, what would you like to hear God tell you when you arrive at the Pearly Gates ? PP : Well, I'm retiring, would you like to take on ? After this interview, we had time to speak about he site, our jobs, studies and hobbies. Max plays oboe and electric guitar. So philip told him : "LMusic is he most wonderful thing. When I was young we moved a lot, and we never had a piano. It was my dearest wish to have a piano. When I was young we didn't have one, but I played the guitar instead. I still got the same guitar. I've got four or five. So I played the guitar but I never learned to play classical music, but that was something I really wanted to, so I envy you." PP : It's always interesting to me to find how people first came to the trilogy because, as you know, when they were first published, it was as children's books. So for the first three years, it was only read by children. But they must have said their parents "Dad, Mum, you must read this book", and parents must have read the book and have said to friends "oh, this is good", "I don't read children's books", "Well, try it anyway !" , and so on. And when the second book came, I remember it, I could see the effect because when I speak at festivals or book fairs, I always look at the audience. For the first book, it was only children ; the second book there were some adults, the third it was half children, half adults. And I think it is the mixture it is now. And I receive letters from adults as well of children. So it has a sort of mixture, and that's what I was looking for all time, I think. PP : Well, if it is a good movie. If it's not good movie, pssssh ! [simulate a plane crashing with his hand] If it is a good movie, [the following in French: maybe... but I think it is quite OK] peut-être... Mais je crois que c'est pas mal. PP : That... When I first described Mrs Coulter, I said she had blond hair. I think that was another one mistake : I think she does has blond hair. In fact, since [he opens an album and show us picture of characters of the movie:] Dakota has blond hair, her mother has blond hair, her father has red-blond hair. It would be best if... Well they look best like this. [He show another picture of Nicole Kidman.] She's perfect, she's magnificent. I'm very happy. PP : I'm not aware where they'll be shooting. But I've seen the script and it's very good. They did a very good job. The film-makers come from Netherlands, they... It's a Dutch fansite. Is it hisdarkmaterials.org ? No, it's Bridgetothestars.net, I can't remember which. But there is a young Dutch man, and the company which is making the Butterfly Tattoo is a Dutch one. They're doing very well. [Signing the Nef's Lyra's Oxford] Jean Esch. He translated it, he's very good. After signing some books, he has left because he had lot of work on the Book of Dust. We were very pleased to meet him and we hope that you liked the report. 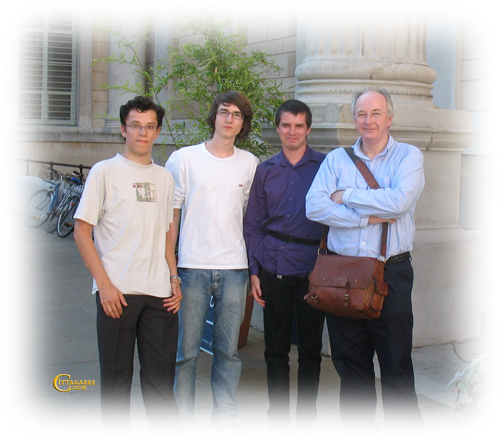 We want to thank Gallimard-Jeunesse who connected us with Mister Pullman, Rey and Max's sister for correction, the man who took the photo of course Philip Pullman himself.